One of the only books never to be out of print since its first publication in 1897 by Archibald Constable and Company, Bram Stoker’s Dracula has appeared in hundreds of editions worldwide. To the collector, early editions are highly sought-after, not only for their antiquarian book value at auction, but oftentimes, for the peculiar details of the edition itself: from the color of its binding to the illustrations or designs on the cover boards. 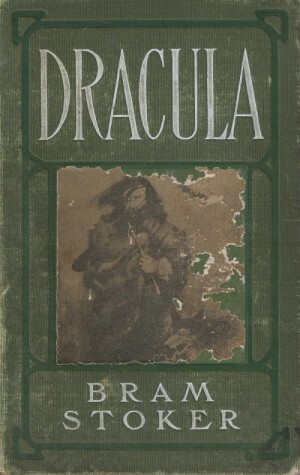 But a study of the physical evolution of the editions themselves can reveal popular culture’s changing attitudes toward the character of Dracula. Confusion abounds as to the true first edition, and many people, even seasoned collectors, are often fooled by reprints that carry only the 1897 date (like the 1927 “Stageplay edition”). My concern is not with the authenticity of early editions or even their value, but of the early illustrations that appeared on the cover of these books. 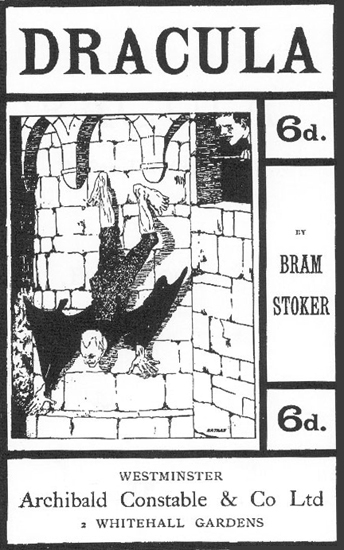 From the black and white line illustration of Dracula scaling the walls of his castle from the relatively rare 1901 edition, to the modern printings that include works of artists like Edward Gorey and Greg Hildebrandt, the depictions of Dracula on the covers and within the pages of the many editions that have appeared over the years are quite telling as they provide a glimpse into changing attitudes toward the infamous Count. Of particular interest to me (mostly because I own it) is the Second American Edition of Dracula published by Doubleday, Page and Co. in 1902. It is curious that the red cloth cover to a 1902 / 1903 reprint of the second American Edition (http://dracula NULL.cc/_img/gallery/dracula_book_cover_1902_doubleday_89_small NULL.jpg) is the only image like it readily found online. But an image of the green cloth binding of the first printing of the second American edition, to my knowledge, has never been readily available, either as a scan posted by a secondhand bookseller or a Dracula historian. 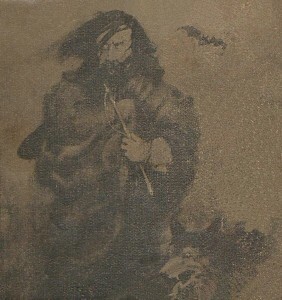 More interesting is that even when covers of the red cloth edition are available, the illustration on the book’s cover, a pasted down Count Dracula with a bat over his shoulder and wolf at his side, has never been made available large enough for study in great detail. Until now. 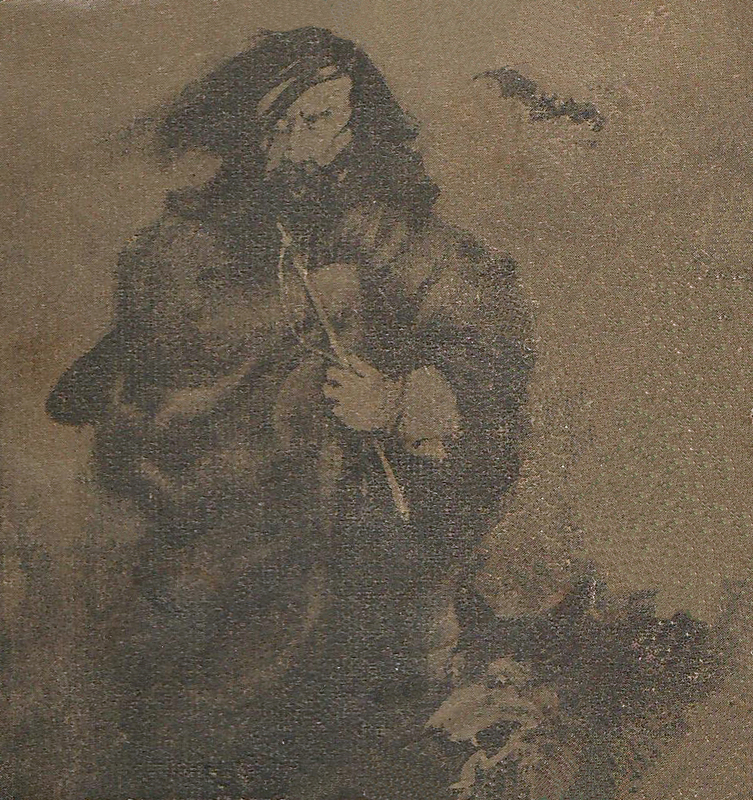 The image below (click on it or here for greater detail) shows an image of the Count, horse whip in hand, with a bat over his shoulder and a wolf at his feet. Is the illustration (restored from my copy’s damaged paste-down [courtesy of the magic of PhotoShop]) accurate? Certainly, Dracula assumes the forms of both bat and wolf in the novel. But it is the description of Dracula himself by which we can best judge the illustration. Of course, it is the more youthful Dracula Harker discovers in the vampire’s coffin, one “looking as if his youth had been half restored. For the white hair and moustache were changed to dark iron-grey” (Harker’s Journal, June 30 [Chapter 4]) that the illustrator depicts, but other than the “lofty domed forehead and hair growing scantily around the temples” could one say this is an accurate illustration of Stoker’s creation? What is most curious about the 1902 edition’s cover illustration, however, is the horse whip in Dracula’s hand. Is this image that of the Count as mysterious coachman who picks up Harker at the Borgo Pass? The Second American Edition of Dracula is unique in its cover depiction of Dracula — not as the bat-like creature scaling the castle walls or the “distinguished and polished” Eastern-European nobleman as would be later described in the Hamilton Deane and John Balderston stageplay of the late 1920s — but as the coachman that serves as Charon to Harker’s Aeneas, ferrying the hero to an underworld as terrifying as Hades. A strange choice for the cover? Perhaps oddly appropriate as the journey into Dracula’s world was being introduced to an even wider American audience who, like Harker, didn’t know what terrors awaited them. For an article that details the history of editions of Dracula, I recommend the excellent and concise eBay guide to editions of Dracula written by Frank Krieger (http://reviews NULL.ebay NULL.com/Dracula-1897-First-Edition-Book-is-NOT-Grosset-amp-Dunlap?ugid=10000000003006737) and Newport Vintage Books’ Top 20 Misidentified First Editions (http://www NULL.http://newportvintagebooks NULL.com/help/firstedition_errors NULL.htm) (also by Krieger).